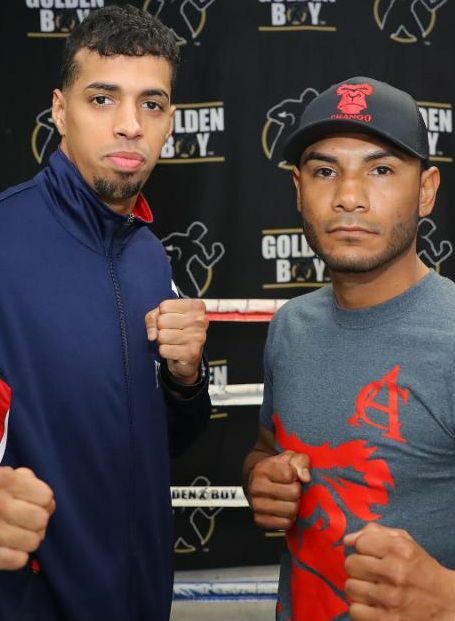 LOS ANGELES (Jan. 31, 2019): WBA Super Featherweight World Champion Alberto “Explosivo” Machado (21-0, 17 KOs) of San Juan, Puerto Rico and 130-pound contender Andrew “El Chango” Cancio (19-4-2, 14 KOs) of Blythe, Calif. hosted a media workout today at Westside Boxing Club in Los Angeles ahead of their 12-round battle. The event will take place on Saturday, Feb. 9, 2019 at Fantasy Springs Resort Casino in Indio, Calif. and will be streamed live on DAZN – which is just $9.99 per month after a one-month free trial. CALIFORNIA BOXING, RCM BOXING NEWS, TRI-STATE BOXING PA, NY, NJ, Victor Garcia's Boxing Media Portfolio Alberto "Explosivo" Machado, Joseph “Jojo” Diaz Jr.